Class 2A is a classification made up the smallest football programs in the state and there is a lot that can happen along the way. 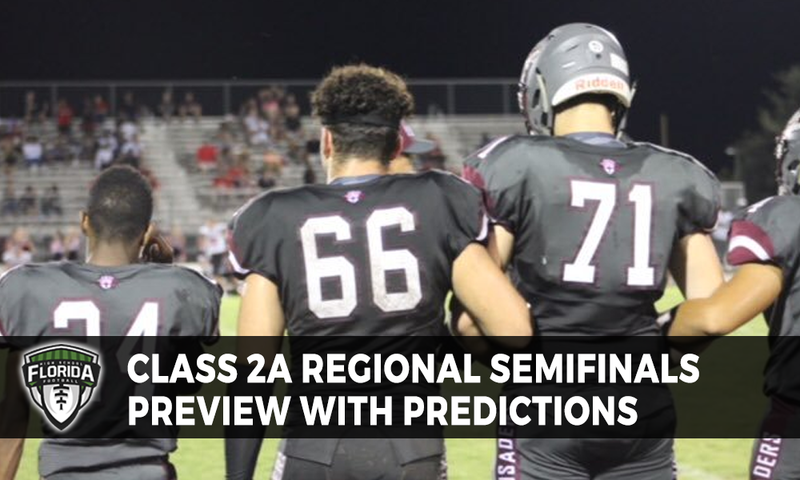 This week’s regional semifinal games will help clear the way even more of who should be in the quest for a state championship and who was on pretending. This will be the first-ever meeting between Zephyrhills Christian and Foundation Academy between the regular season and postseason … Last week the visiting Warriors defeated St. Francis Catholic, 55-0 … The host Lions drew a first-round bye last week and finished their season in Week 11 picking up a forfeit win over Carrollwood Day after a tornado damaged Carrollwood’s fields that lead to the forfeit … For Zephyrhills Christian keep an eye on Javion Hanner who had 150 yards rushing and two touchdowns … Keep a watch on quarterback Henry Austad who has passed for over 1,600 yards and thrown 24 touchdowns this season. No. 3 University Christian (7-4) at No. 2 Maclay (10-0), 7:00 p.m.
No. 5 Deltona Trinity Christian (7-4) at No. 1 Victory Christian (9-1), 7:00 p.m.